(John) Thomas Playfair, known as Thomas, was born at Earls Colne, Essex, England, on 14 January 1832. His mother Mary Anne Arnold was also a native of Essex, and his father, Thomas Playfair, gave his birthplace as St Andrews, Scotland, at the time of his marriage to Mary Anne, but no record has been found of his birth. Thomas Playfair (senior) gave his profession as a tailor, and a publican, at varying times. Thomas Playfair (junior) joined the British Royal Navy at the age of 12 in 1845, and served on a number of ships including Hecla, Tyne, Rattler, Hecate, Asia, Swift, Brisk, and Pelorus, on which ship he traveled to Melbourne as Wardroom Steward, arriving on 30 September, 1859. Here he was voluntarily discharged, and almost immediately made his way to Sydney, arriving there on S.S. London on 7 October, 1859. In 1860 Thomas formed a partnership with Edmund John Bailey, a carcass butcher, trading as Bailey and Co. In the same year he married Ellen Matheson, a younger sister of Baily's wife Margaret. In 1860 the partnership purchased the Shipping Butcher business from George Read at 107 George Street Sydney and traded as Baily and Playfair. After Baily's death in 1862, it appears that his wife Margaret sold his interests in this business and the shops at South Head Road and Crown Street to Thomas Playfair. After the death of Ellen Matheson, Thomas married her half sister, Georgina, in 1867. The property was originally leased to Thomas, but at sometime prior to 1882 Thomas purchased it and the business remained there until the early 1900s except for a period from c1879 when he leased it to other interests while he rented 101 George Street across the Suez Canal to carry on his business until he returned to 103 in 1885. The names Baily and Playfair continued to be linked in the business until c.1885. Thomas must have had great respect for Baily as he named his second son Edmund John Baily Playfair. Thomas may have had some knowledge of the meat industry, because his mother's sister Susannah was married to a butcher, Henry Hugh Tipper who had his business at Whitechapel in England. Also his own older sister Mary Ann (p.103) was married to another butcher, Walter Chaplin. However, Thomas had been at sea for most of his adult life. Thomas two surviving sisters, Mary Ann Chaplin and Susannah Tipper also migrated to Australia. 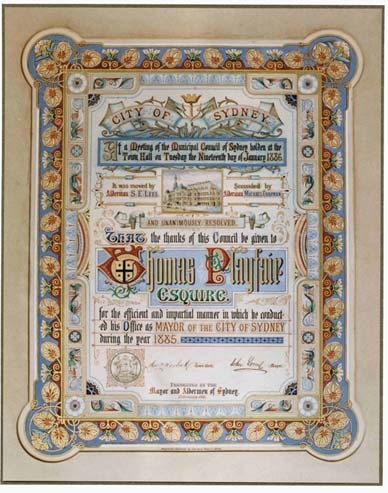 During Thomas term as Mayor a medal was struck to commemorate the Return of the Soudan Contingent, inscribed PRESENTED BY THE CITIZENS OF SYDNEY, T PLAYFAIR, MAYOR 1885. A coloured picture was also published in a supplement to Illustrated Sydney News on Saturday July 4, 1885 to celebrate the occasion. The scene was in Oxford Street and the Baily and Playfair shop was clearly visible in the original picture. Thomas Playfair was responsible for the establishment of the Homebush saleyards in 1882 at a cost of 60,000 Pounds. The brass plaque originally found on the foundation post of the saleyards is now in the possession of Ross Playfair. The plaque reads THIS POST WAS LAID BY ALDERMAN THOMAS PLAYFAIR JP ON 20TH SEPTEMBER 1881. JOHN HARRIS ESQ. MAYOR. Nearby was the Thomas Playfair Memorial Fountain, which now stands within Sydney Olympic Park. Amongst the memorabilia held by John Feakes is a beautiful trowel with an ivory handle, with the inscription PRESENTED TO THOMAS PLAYFAIR ESQ. MAYOR, BY THE DIRECTIONS OF HER MAJESTYS THEATRE AND GRAND OPERS HOUSE ON THE OCCASION OF HIS LAYING THE FOUNDATION STONE. JANUARY 27TH 1885. 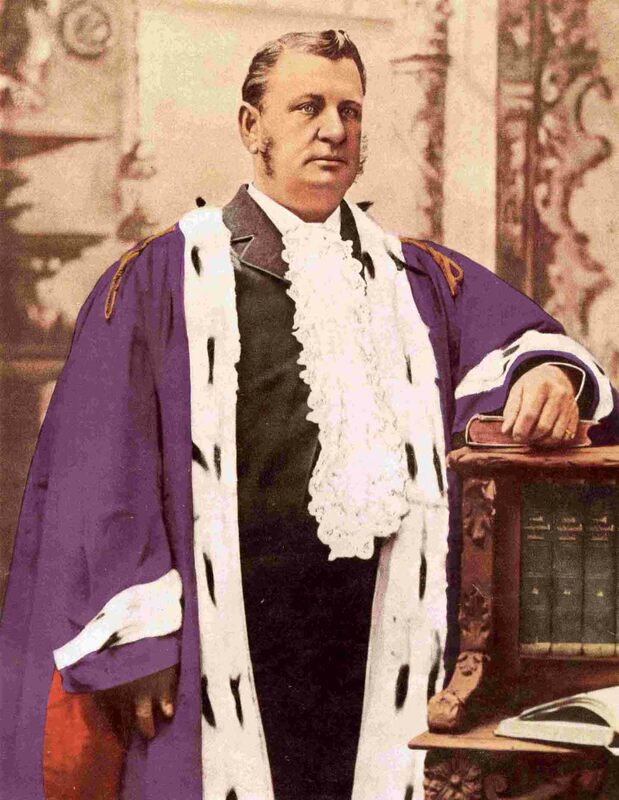 Thomas Playfair entered politics on 2 February 1889, being elected to the Legislative Assembly as a member for West Sydney and as a free trade supporter of Sir Henry Parkes. They belonged to no Party, but the sitting members were defeated at the elections on 6 June 1891. These elections were regarded as historical because it was at this time that the Australian Labour Party first won seats in the Legislative Assembly, thus permanently changing the political make-up of the Chamber. On 6 October 1891 Thomas was called to give evidence at the Chinese Gaming Commission to consider its effect on the local community. Thomas earliest recorded residential address was Wimbledon Cottage at Waverley in 1864. It is believed that Thomas resided at 103 George Street, Gloucester Street and Argyle Place before moving out of the Rocks area in about 1887 to Goldah House at 61 Darlinghurst road (Kings Cross), which he renamed Chelmsford after the capital of the English county of his birth, Essex. Thomas Playfair died at his home on 15 November 1893. 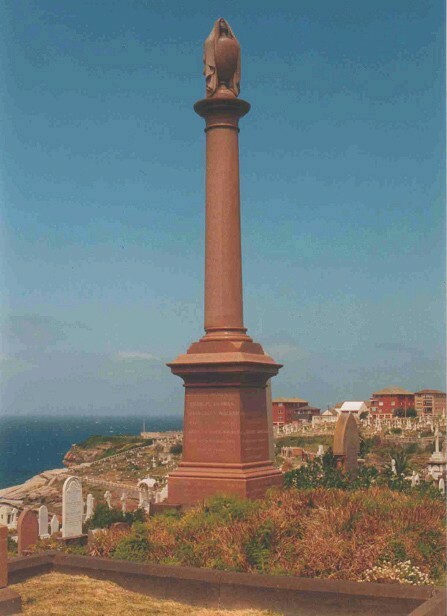 He was buried at Waverley Cemetery in a family plot with four graves and an impressive brown granite monument. This plot also holds the remains of other Playfair members, including his first son Thomas Arnold and his wife Olive, and Thomas daughter from his second marriage, Jessie with her husband Francis Walker and their sone Francis and Alfred (Wakka). A stillborn baby Walker was also interred there on 19 January 1924. At the time of his death, Thomas Playfairs Estate was valued at over 33,000 Pounds. This included a good deal of real property, much of which he left to his daughter and sons other than Edmund, to whom he left the meat Company. Thus Edmund became the Companys sole owner. In 1960, to commemorate the centenary of the meat Company, Thomas Playfair Pty Ltd, his descendants erected the memorial Doors in The Garrison Church at Millers Point, in memory of Thomas. Thomas Children with his first wife Ellen Matheson were Thomas Arnold 1861-1898, who married Olive Maria Milsom, Edmund John Baily, 1863 - 1926, who married Edith Miriam Creer, and Alexander and Alfred Matheson, who both died as infants. His children with his second wife Georgina Matheson were Jessie 1868-1942, who married Frank B Walker, Alfred Donald 1871 - 1943 who married Florence Edith Pitt, and Walter, born and died in 1872. They also had two children who died in infancy, prior to the birth of Jessie. 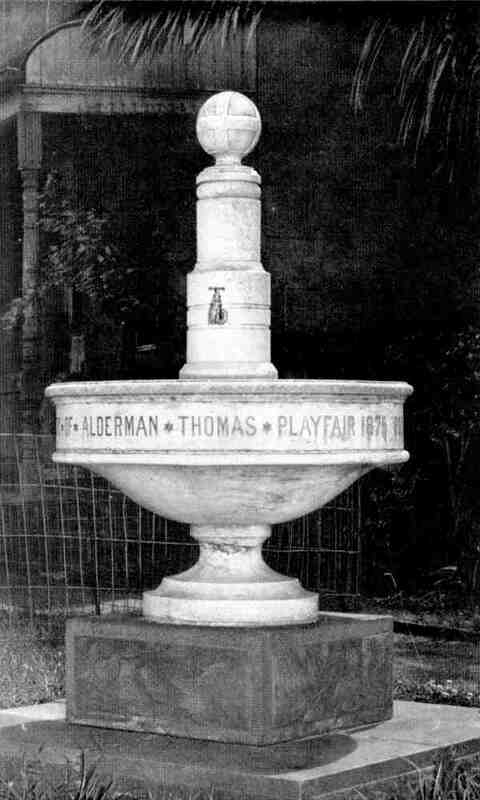 The Fountain was unveiled at the sale yards at Flemington by the Mayor of Sydney, Alderman Isaac Ellis Ives, on 28th May 1896 as a memorial to Alderman Thomas Playfair (1875-1893). After the official speeches at the unveiling, Mr Edmund Playfair, on behalf of the Playfair family, thanked the gathering from the bottom of his heart for the kind expressions that had been used of his father. The fountain remained in place until 1st March 1968 following the responsibility for the newly created Sydney Produce Markets being transferred to that Authority. It was relocated in front of the new saleyards Administration Building at Homebush Bay. Following the closure of these saleyards and the Homebush Abattoir, the area was developed into the site for the Olympic Games to be held in the year 2000. The fountain underwent another move within Olympic Park, this time to its present site in the Heritage Garden adjacent to the café. The fountain was sculpted in NSW marble from Caloola Creek, near Bathurst, on a base of Bowral trachyte, by William Mackintosh at a cost of 71-00. Taken about 1866. Photo by courtesy of Sylvia Gronwald. 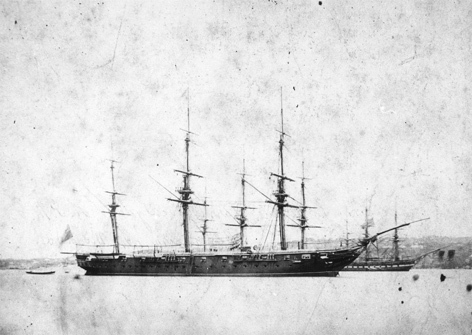 The Pelorus, on which Thomas Playfair arrived in Australia was the second ship of the British Royal Navy bearing that name.